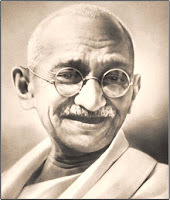 There are two nouns in the title of the autobiography of Mahatma Gandhi, My Experiments with Truth. These words, "experiments" and "truth," help define the intent of this blog. We call the blog "Living Nonviolence." We hope to provide information about experiments in nonviolence carried on daily by people around the globe. We hope to provide inspiration to those who are trying to live the truth of nonviolence in their daily activities and relationships. I'm grateful to Gandhi for his recognition that nonviolence can be understood as an experiment. There's a certain degree of grace here. There's also a recognition that violence is deeply embedded in the psyche of each and every one of us. Experimenting with living nonviolence is not so much about making judgments and naming failures. It's more about trying again. Experimenting with living nonviolence is not about exclusion, setting the redeemed over against the condemned. It's more about inclusion, patience, persistence; changing enemies into friends. Experimenting with living nonviolence places as much importance on the means as it does on the ends. And as Gandhi suggests, "Satisfaction lies in the effort, not in the attainment. Full effort is full victory." I'm also grateful to Gandhi for his conception of Truth. It comes from the sanskrit Satya. Rendered "Truth" in English, it means "that which is." Gandhi even says, "Truth is God." Liberally interpreted, one could say that satyagraha, Gandhi's term for nonviolence, is the force of divine Truth. That's the force one uses to stand up to violence! Truth is also understood by Gandhi to be divisible in the human heart. My truth may be different than yours. It is impossible for one person to possess the whole Truth. Perhaps one can perceive it but not possess it! We are always in need of being open to the truth of the other. In this blog, we are inviting people to share with us their experiments in Truth. How do you see nonviolence at work in everyday life? What insights, what habits, what relationships, what activities have encouraged you in living nonviolence? Might your thoughts and experiences also inform and/or inspire others? This is our intent! Schedules permitting, we expect to post new material twice a week, on Tuesdays and Thursdays. If you would like to join the continuing conversation, please subscribe. If you would like to respond to a particular post, please use the comments button below it. If you would like to write occasionally about your experiments with the force of truth, let us know. We expect to have many authors.